Tiki culture in the United States began in 1934 with the opening of Don the Beachcomber, a Polynesian-themed bar and restaurant in Hollywood. The proprietor was Ernest Raymond Beaumont-Gantt, a young man from Louisiana who had sailed throughout the South Pacific. His restaurant featured Cantonese cuisine and exotic rum punches, with a decor of flaming torches, rattan furniture, flower leis, and brightly colored fabrics. 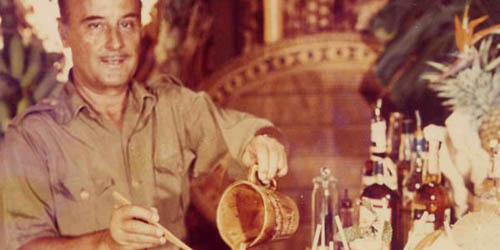 Three years later, Victor Bergeron, better known as Trader Vic, adopted a Tiki theme for his restaurant in Oakland. Tiki culture of mid-century America was primarily born in the restaurant industry. Most tiki-themed establishments served at least some of their cocktails in ceramic mugs depicting tikis; also known as tiki mugs. The styles and sizes varied widely. Most restaurants offered their signature drink in a tiki mug that the patron was able to take home. This led to a large number of tiki mugs surviving as souvenirs. Today, the tiki mug is a highly prized find and is considered to be as much a symbol of the Tiki culture as a tiki itself.